Edward Parmentier, Harpsichord (WLBR 0401) Edward Parmentier plays the 1785 harpsichord made in Paris by Jacques Germain in America’s Shrine to Music Museum, Vermillion, South Dakota. Peter Nothnagle, engineer and editor; Joseph Spencer, producer. 2 CDs, 129′ 41″. DDD $31.98. Bach composed these pieces early in life, before any of the other suite sets (French Suites, Partitas). They portray a young Bach bursting with energy, dexterity and ideas, and rapt enthusiasm for the newest styles of the day- the Italian concertos of Vivaldi, and the French harpsichord suites of D’Anglebert, Daquin and Couperin. Melding these powerful forms with the already Italianate German fantasy or toccata, Bach produced some of the world’s first true virtuoso keyboard masterpieces. Little wonder that his contemporaries were dazzled. 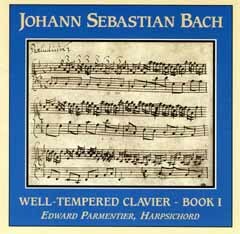 The Jacques Germain harpsichord has starred on Wildboar recordings before: Arthur Haas’ essays of D’Anglebert and Forqueray, as well as Mr Parmentier’s recordings of the Bach Toccatas. One of the latest historical French harpsichords extant, it is an ingratiating instrument that proves its flexibility in a broad spectrum of pieces from the 17th French to late German repertoire. Owing to the clarity of its tone and immediacy of speech, it renders the most intricate polyphonic textures transparent and perfectly intelligible, proving an excellent vehicle for these diverse styles. Peter Nothnagle, engineer and editor; Joseph Spencer, producer.